This is our most popular itinerary, especially from North America where vacations are shorter; it spends 11 days aboard the yacht, but can fit into a two week vacation. This program has a very strong Natural History focus and is appropriate for most photographers, You visit the significant outer islands, and its pace allows for a maximum of wildlife observation. Day 13 (morning): MOSQUERA - This is a tiny islet, really more of a long, narrow sand spit, with a huge population of sea lions. Additional occupants include Sally Lightfoot Crabs and lava lizards, plus a wonderful variety of birdlife flying over. 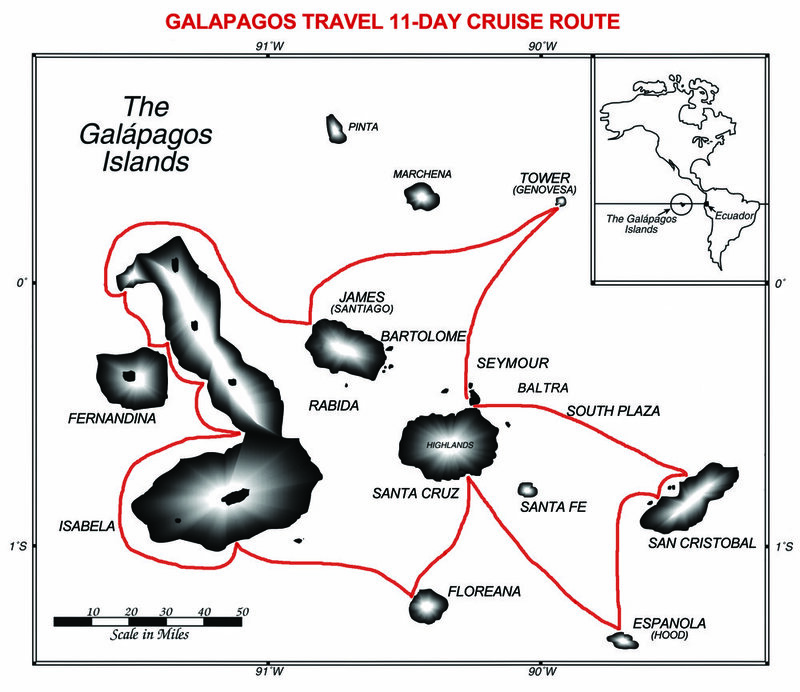 It makes a perfect "last landing" to reflect on the wonders of Galápagos experienced during your 11 days in the islands. • BALTRA - A mid-morning departure will have us back in Quito this afternoon. Wondering about the difference between routings? See our extended 15-day trip. Day 13 (afternoon): After a late afternoon, we will be transferred to the HOTEL MERCURE ALAMEDA where we will spend the night. We will have a group Farewell Dinner at one of the leading restaurants in Quito. Day 14: Transfer to the airport today for your return flight home. Or, remain in Ecuador exploring the High Andes, Amazon Basin, or tropical cloud forests. See Explore Ecuador for options.